They look a lot alike, and indeed urethane is a type of rubber. Here’s how to pick between the two materials for your dumbbells. Rubber is known to degrade a little over the years and show some signs of use. High end commercial gyms nowadays get urethane because it doesn’t show its age even after years. It’s good for a health club’s classy style to have new looking equipment all the time. Clients don’t want to see evidence that the dumbbells they’re picking up have plainly been handled and sweat on by thousands of people, even if they know it in the back of their minds. Of course, on the flipside, you can feel about the same guilt about urethane as you do about plastic bags at the grocery store. It’s not gonna decompose before your or your children’s time. The difference is urethane dumbbells could still be in use at a gym by the time you’re gone. Urethane is odorless by nature. The only thing you could possibly smell is if there’s oil on it from the factory to protect it during storage and transport. Wipe that stuff off. Virgin rubber is pretty good. You should not smell anything, or it will be barely perceptible close up even if you’re sensitive. Recycled rubber always has an odor for a while until it has a chance to off-gas out in a large ventilated room. However, I’ve heard that it isn’t so much that it’s recycled rubber (from tires, I guess?) as it is an inferior formulation. The Chinese apparently will sometimes dump used oil into the rubber formulation, and that’s what you’re smelling. It’s probably not good for you to breathe in, but I wouldn’t be concerned about it as far as health issues. The vegetable oil on that deli salad is hurting you a lot more. Just let the rubber air out if you’ve got the patience. Urethane often has a smooth, non-tacky surface. High quality virgin rubber is pretty smooth too. Recycled rubber always has a rougher texture. Another difference is urethane is a denser material. It doesn’t give as much as rubber. It holds together under shock loads, so you’re not losing anything in terms of durability from being dropped. The hardness factor helps lend urethane to custom engraving (below). Both rubber and urethane surfaces can vary from model to model. Some models of urethane or good rubber have a matte/textured surface that stays looking new for a lot longer than their smooth counterpart. Smooth rubber or urethane surfaces still look fine but can show scuff marks in the right light. Good urethane coatings are very thick. It’s more of an encasing than just the paint-like coating that rubber has. You can see this in the cross sections of sliced-open dumbbells that some manufacturers display to prove the point. Logos are easier to engrave on urethane. You can do it on some virgin rubber dumbbells too, but on urethane a color logo comes out clear and detailed, and if it’s done well it’s going to stay looking good for many years. Urethane is always more expensive. It heavily depends on the model, and one factor in the price is what weight tolerance it has. You pay a premium for weights guaranteed within 2% or so of the marked weight. 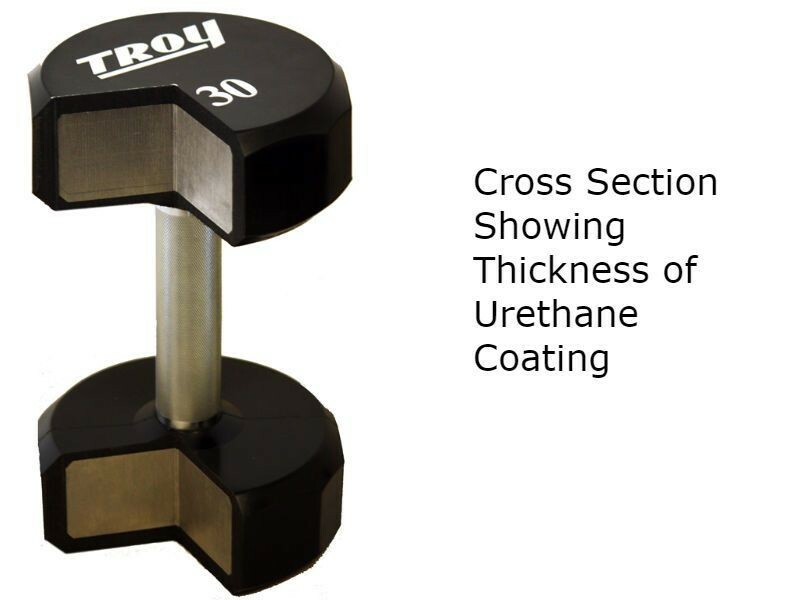 Urethane dumbbells aren’t always priced per pound like rubber and iron dumbbells. 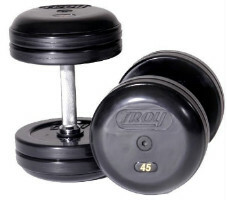 At the moment urethane dumbbells can vary from $2 to $8 per pound, with the heavier ones being cheaper per pound. Check out different sizes, or add up the whole set to get a better idea. 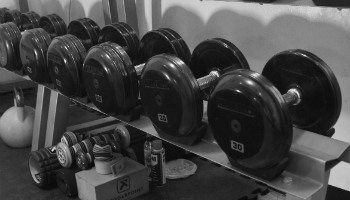 Rubber dumbbells tend to be priced per pound, usually around $2 to $2.50 per pound. Rubber dumbbells come in every head shape: round, 6-sided (hex), and even 8 or 12 sided in certain models. The example below are rubber hex dumbbells of particularly high quality. “Pro-style” dumbbells made of individual plates stacked together, like Troy’s and Ivanko’s below, are rubber as well, not urethane. 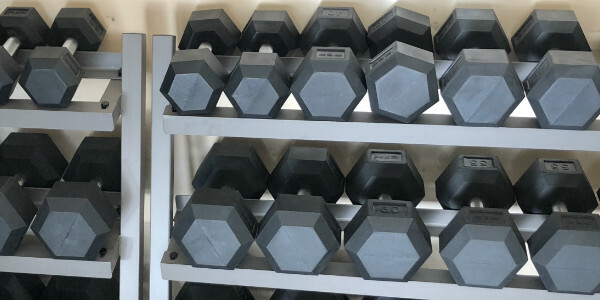 Urethane dumbbells come in both multi sided and round head versions, but 6-sided in particular is rather rare for urethane because they tend to be of higher quality and that means more sides to the dumbbell to make the edges softer. 12-sided heads are pretty nice because they fit well in a commercial style rack with saddles for each dumbbell, while not rolling away on the floor.